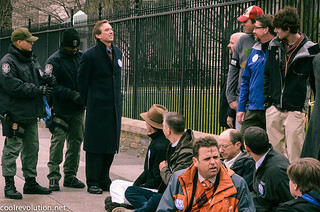 DemocracyNow.org – Forty-eight people, including civil rights leader Julian Bond and NASA climate scientist James Hansen, were arrested Wednesday in front of the White House as part of an ongoing protest calling on the Obama administration to reject the Keystone XL tar sands pipeline. The action came before a rally planned for Sunday on Washington’s National Mall, which organizers have dubbed “the largest climate rally in history.” We speak to Sierra Club Executive Director Michael Brune, who was arrested in the first act of civil disobedience in the organization’s 120-year history. Unless we take bold action to reverse climate change, our children, grandchildren and great-grandchildren are going to look back on this period in history and ask a very simple question: Where were they? Why didn’t the United States of America, the most powerful nation on earth, lead the international community in cutting greenhouse gas emissions and preventing the devastating damage that the scientific community was sure would come? The issue that we are dealing with is not political. It has nothing to do with the squabbling we see in Washington every day. It has everything to do with physics. The leading scientists in the world who study climate change now tell us that their earlier projections were wrong. The crisis facing our planet is much worse than they had thought only a few years ago. 12 out of the last 15 years ranked as the warmest on record in the United States. Now, scientists say that our planet could be eight degrees Fahrenheit warmer or more by the end of this century if we take no decisive action to transform our energy system and cut greenhouse gas emissions. What would that mean to planet earth? Sea levels would rise by three to six feet, which would flood cities like New Orleans, Boston and Miami and coastal communities all over the world. It would mean that every year we would see more and more extreme weather disturbances, like Hurricanes Irene and Sandy, costing taxpayers tens of billions of dollars every year and resulting in devastating blows to our economy and productive capabilities. We would see the price of food go up because crops in the US and around the world would be affected by temperatures substantially greater than what we have today. It would mean greater threats of war and international instability because hungry and thirsty people would be fighting for limited resources. It would mean more disease and unnecessary deaths. Legislation that I introduced (pdf) with the support of leading environmental organizations in the country can actually address the crisis and do what has to be done to protect the planet. Senator Barbara Boxer of California, chairman of the Senate Committee on Environment and Public Works, co-sponsored the bill that would reverse greenhouse gas emissions in a significant way. It also would help create millions of jobs as we transform our energy system away from fossil fuel and into energy efficiency and such sustainably energies as wind, solar, geothermal and biomass. A major focus of this legislation is a price on carbon and methane emissions. This fee on the largest fossil-fuel polluters affects fewer than 3,000 entities nationwide but covers 85% of the greenhouse gas emissions in the US, according to the Congressional Research Service. The legislation ends fossil fuel subsidies. It also protects communities by requiring that drillers engaged in a new technology called fracking must comply with the Safe Drinking Water Act and disclose chemicals they use. To help consumers, 60% of the carbon fee revenue will be rebated to every US resident. To level the playing field for US manufacturers and create incentives for international cooperation, there would be a border fee on imported fuels and products unless the nation they were shipped from had a similar carbon price. To transform our energy system, the legislation would make the boldest ever investment in energy efficiency and sustainable energy. That includes weatherizing one million homes a year, as President Obama has advocated. It also means tripling the budget for advanced research and investing hundreds of billions through incentives and a public-private Sustainable Technologies Fund focusing on energy efficiency and clean transportation technology, as well as solar, wind, geothermal and biomass alternatives. In our bill, we also provide funds to train workers for jobs in the sustainable energy economy and to help communities become resilient in the face of extreme weather. We accomplish all of this while paying down the debt by roughly $300 billion over ten years. With President Obama’s commitment in the state of the union address to reverse global warming, we have the opportunity now to make progress. The president must use his executive authority to cut down on power plant pollution and reject the dangerous Keystone XL project. But he must not give up on a comprehensive legislative solution, and neither should we. We will never fully deal with this crisis until Congress passes strong legislation. Senator Boxer and I are going to fight as hard as we can to do that, and we will work to rally support from American families all across this country that care deeply about their children and grandchildren’s future, and want to protect them from this planetary crisis. Thank you for all that you do and for your efforts to combat climate change. This entry was posted in All Posts News Politics and-or Videos, Dandelion Salad Videos, Environment, Global Warming, Global Warming on Dandelion Salad, Politics and tagged Activism - Protests - Boycotts, Barbara Boxer, Climate Crisis, Daryl Hannah, Keystone Pipeline, McKibben-Bill, Michael Brune, Sanders-Bernie. Bookmark the permalink. Updated: Added a message from Sen. Bernie Sanders, “Congress Must Act to Combat Climate Change”.